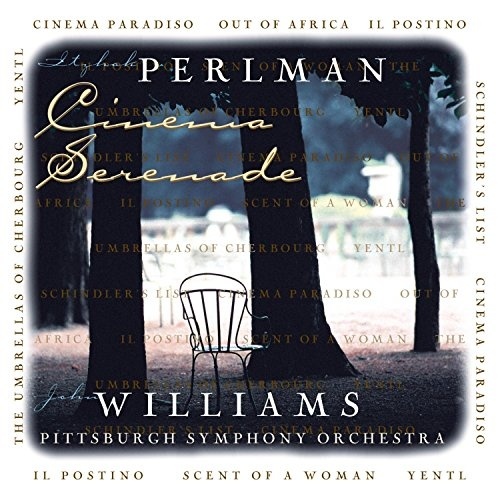 Cinema Serenade came to be as a result of the 1992 collaboration of the world's premier film composer, John Williams, with one of the world's finest violinists, Itzhak Perlman, on the score for Steven Spielberg's Holocaust epic Schindler's List. The duo reunited to create a collection of excerpts from a variety of different film scores presented in new arrangements that are centered around Perlman's violin. Williams arranged most of the numbers and conducted the Pittsburgh Symphony Orchestra. The selections are a strange hodgepodge culled haphazardly from some 50 years of film history. As you might expect, the theme from Schindler's List is included. And it's not surprising to find Oscar honored scores like Out of Africa (John Barry) or Il Postino (Luis Bacalov), The Age of Innocence (Elmer Bernstein) and The Color Purple (Quincy Jones, Jeremy Lubbock, Rodney Templeton, Jeff Rosenbaum). But some of the other selections are less predictable. There are songs from musical comedies ("Papa Can You Hear From Me?" from Yentl, "I Will Wait for You" from The Umbrellas of Cherbourg). There is a Carlos Gardel tango that was used briefly in Scent of a Woman, but was not composed for a film. Most rewardingly, there are some memorable musical selections from the oft-neglected realm of foreign film. In addition to Bacalov's theme from Il Postino, a beautifully sentimental melody with tango-like flourishes, there are excerpts from Luis Bonfa's Black Orpheus, Andrea Morricone's Cinema Paradiso, and Andre Previn's Four Horsemen of the Apocalypse. Perlman's gorgeous solos add breadth and scope to nearly all of the compositions, demonstrating that they work as well in the concert hall as they did in the movie theater. The only real lightweight pieces included were both composed by Williams himself. Far and Away and Sabrina are hardly the brightest points in Williams' career; the scores were nearly as forgettable as the films themselves. (The latter did receive an Oscar nomination for best musical or comedy score, but it never would have been selected if anyone else had written it.) But fans of film music will generally be pleased by this collection, and in some cases may prefer the Perlman versions to the originals.